Last month we went over the Passenger Space Ratio, and this month we will continue on with a few more interesting numbers that describe cruise ships. We’ll take a look at the crew to passenger ratio, why we have nautical miles, some of the dimensions of cruise ships, and a pet peeve of mine. One easy number is the crew to passenger ratio. I think of this as the “How much will I be pampered?” number. While I wouldn’t use this to decide that I’m not going on a particular ship, it does give an idea of how many passengers each crew member needs to ‘take care of’. Some crew may not be directly involved in guest service, but they need to be included because they keep the air conditioning running, emergency equipment in order, etc. The math for this one is as simple as taking the number of passengers (double occupancy) and dividing by the number of crew. The ratio can be a little misleading if you are comparing an older ship with a newer, more efficient ship, since fewer crew are required on a more efficient ship. So, allow for a little fudge factor range for this one. The table below has a few examples. The nautical mile may seem to be a bit of a puzzle. Why do we have them, and why are they different than land miles? The easy answer is history and some seemingly random choices to create an international standard. A land mile is 5,280 feet. A nautical mile is about 6076 feet. Yup, that makes a lot of sense. The actual answer is that a nautical mile is 1/60th of a degree or one minute of latitude. There. Done. Not very fun, but we’re done. It turns out that the earth isn’t quite round, and it really matters at sea to have a ‘standard’ distance that helps to make it easier to navigate. Since we’re mainly interested in how far we’ve gone and how far that would compare to on land, you can take the nautical miles that the captain gives you and multiply by 1.15 to give statute (land) miles. Going the other way, you can multiply land miles by .87 to get nautical miles. Both of these are not exact, but are a pretty good approximation. Especially when you are at sea on vacation. It wouldn’t be any fun if we could just leave it at that. Knots and nautical miles are related. One knot is 1 nautical mile per hour. So if the ship’s maximum speed is 20 knots, it can go 23 miles per hour (land miles per hour). The “knot” comes from how speed was measured a long time ago. Sailors had a rope with knots tied in it every 47’3” and it was thrown overboard and the number of knots that ran out in 30 seconds were used to report the ship’s speed to the bridge. So 5 knots that went overboard in 30 seconds meant that the ship was moving at 5 nautical miles per hour. The fact that “knot” and the “naut” in nautical sound the same is just a wonderfully confusing coincidence. Ever since my first cruise on the Disney Magic back in 2002, I have always been amazed by the size, complexity and the operation of cruise ships. Even relatively small ships like the Azamara Journey are tremendous feats of engineering and construction. Ships are generally categorized by whether or not they can fit through the old locks of the Panama Canal. The locks are 1000 ft. long and 110 ft. wide, and they do try to use every bit of space. The largest ship ever to transit the canal was 973 ft. long. The widest ship ever to make the transit only left about 6 inches on each side. 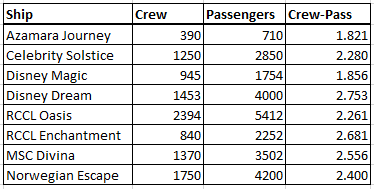 The following table shows some of the differences between cruise ships for length, width draft and speed. While they all seem to fall within a general range, it is interesting to see that the Oasis only draws about 12 feet more draft as the Azamara Journey, but is about 7 times larger in gross tonnage. Note that Length, Beam and Draft are all in feet. The size of the ship doesn’t matter as much as I would have thought as far as the effect of the waves. I’m fortunate to not get seasick, but I can tell when the ship is moving a lot. I’ve been on Royal Caribbean’s Oasis of the Seas and on the Azamara Journey. Yes, the Oasis is less prone to movement, but the Journey was surprisingly stable when faced with moderate wind and surf. One big difference here is that the Journey was able to find an alternate port when it was too windy to get into Falmouth, and so we ended up in Montego Bay instead. In this case, a small ship with less draft allows for more opportunities to change the itinerary on short notice. Last but not least for this month is a pet peeve of mine. A cruise ship should never be called a “boat.” Ever. Especially to officers, crew and staff. By the most common definition, a boat can fit onto a ship. A ship cannot be carried by a boat. There are lifeboats, speed boats, pontoon boats, sailboats, fireboats, rowboats, yachts and punts. These can all fit on a ship. A ship cannot fit on anything else. You don’t want to offend the people that are taking care of you onboard. A cruise ship is where I go on vacation. I get on a boat to do a little fishing, snorkeling or just cruise around on a lake. Of course, rules always have exceptions. For some reason it is perfectly OK to call a submarine is a boat. Don’t ask me why.